Warm, light, compact, goes below 32. Bad first, I hate the zipper on this darn thing. If I was mummied and had to escape a bear, I'd die. I don't know if that's true or not, but I do not enjoy zipping this thing all the way up. I like the two side half-zips, and the pulls on the inside and out... but it gets caught on the bag (especially when you're in it) and just isn't easy. Though I have yet to hear anyone rave about their bags' zippers, either. That being said, I think this is an excellent bag. For the price (and you can find these bad boys nice and cheap) combined with the weight and the compression, I think this is a fantastic bag. I disagree with the user who was cold during summer — I have taken this to about 35 degrees and been warm. I do have a sleeping pad, which helps, but I slept in it with and without any baselayers on, and have woken up nice and toasty, perhaps a little too toasty in summer. Actually, on our last hike, it was 35 and damp at night, I didn't even full-mummy it, and was very warm with my silk baselayers on. I'm 5'2" and have the 64" women's bag. It's the perfect size. I have a big chest, and it's roomy. 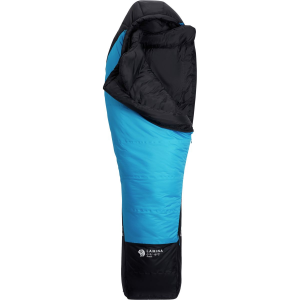 It's so soft, I like that it is synthetic because I am clumsy and have a tendency to spill things, and it packs down very small with the compression sack. My partner's down bag packs down a little bit smaller and lighter, but it loses feathers, and isn't as soft as mine. The UltraLamina puffs up very quickly, packs down quickly, and has been comfortable from about 70°F to 35°F, though I'm a little scared to go lower than that. Mediocre bag, but at a steep discount may be worth considering. Zippers get snagged in material all the time. Half zips do not allow venting. I wanted this bag to be the bag that I could carry all the way thru on my upcoming thru hike of the Appalachian Trail. I was excited when the bag arrived at my home as I noticed its light weight and its compressibility when using the included compression bag. However, after using this bag for a year, it is becoming less desirable to me. 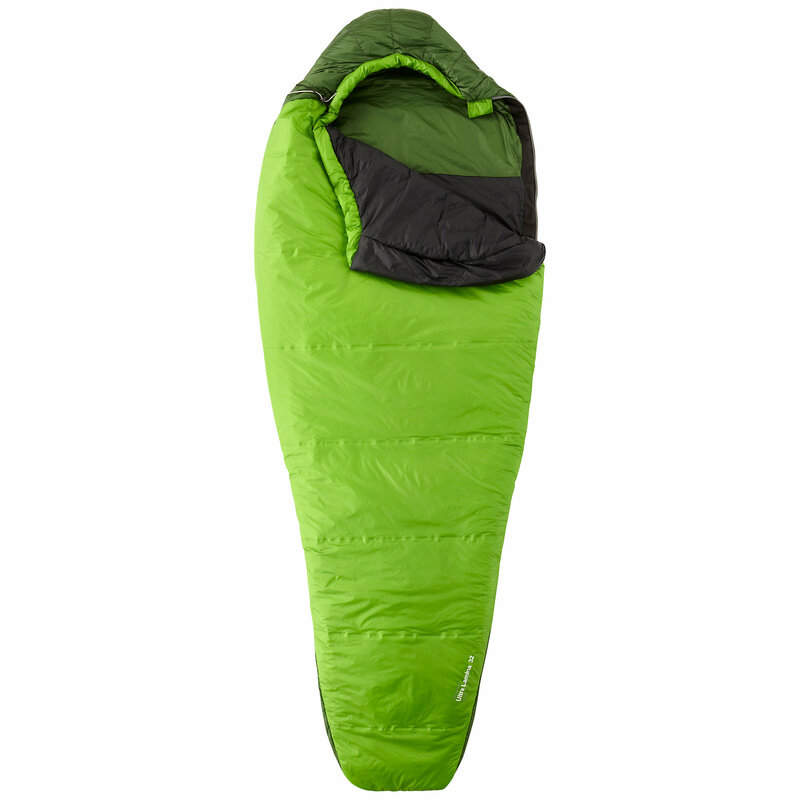 The fit and finish is about average for a large sleeping bag manufacturer. Decent but not perfect but it wears well. The zippers are a half zip design which makes entering the bag a bit more difficult. The zippers constantly snag on the material when zipping up the bag and it is a struggle to free the material. This is a common problem with this bag after looking at all the complaints at the review sites on this bag. The half zips make this bag unusable at warmer temperatures as the bag is difficult to vent and dump warm air if you are hot. Note this bag is a mummy bag and is a bit narrow...side sleepers beware it may not work well for you. This bag is not a 32 degree bag. At its best I would put it at a 40 degree and more likely a 45 degree bag. There are noticeable cold spots andI have to put on a heavier layer when sleeping with this bag around its stated temperature minimun. This was disappointing, as is unusual for me to sleep cold and I am comfortable in my other bags past their temperature rating...toasty warm. It is not a bad bag if bought on sale around $120 dollars. If you are looking for one bag that is a truly 3-season bag, this bag is not for you. 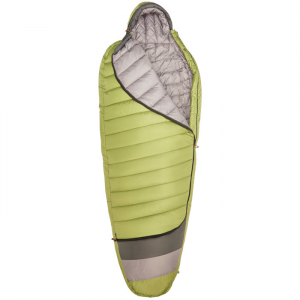 However, if you are trying to minimize your pack weight and will be camping in a narrow temperature bag, this bag will be a decent bag in your inventory and may serve you well. As for me, this bag is becoming a loaner bag for friends that need to borrow equipment and am reconsidering using a quilt for the warmer section of my hike and my Western Mountaineering Versalite for the mountain spring and fall portions of my hike. I want to like this bag but I just can't see much value much beyond a budget bag. Got this bag because of the weight and ability to compress into near nothingness. I also really liked that the zippers on on both sides were only half zips. Plus you can zip the bottom zipper up and make an arm hole so you can stay in the bag and still get gear from around the tent. I must say this feature was amazing last weekend on a section of the AT in Shenandoah, temps dropped to below 20 and here I am with my 32 degree rating. I slept in everything I had except my rain gear and was very comfortable. In fact come to think of it I haven't spent a night above 35 while I've owned this bag and I'm still raving about it! Since this bag has the ability to compress to such a small bundle I highly recommend a compression strap stuff sack. I purchased one from Granite Gear and couldn't be happier. I'm 5 ft 8 inches and I have plenty of room in the bag. Even when I sit up I can half cross my legs indian style in it. It also has a very roomy zipper pocket by the hood that's great for those items you always may need handy. If you are in the market for a bag and DON'T plan on doing much cold weather camping, then this is for you. Even if you do end up in the biting wintery winds of the mountains you will be perfectly fine if you know how to layer and have already dressed accordingly. Synthetic bag with the weight of down! I have used this bag in temperatures ranging from the 60's to the 20's. Worked well in all situations although on the colder nights I did have to put on a few more layers of clothing. But since the temperatures dipped below the rating of the bag I can't complain. Compresses really well, about the size of a football. Vents well and the foot box is roomy enough for me. Only complaint is that the compression bag that came with the sack broke only after the second use. I now just use a larger sack with no compression to lengthen the life of the synthetic fill. All in all great bag. I love this bag. I used it for a 5-night trip to Clear Creek in the Grand Canyon. The coldest night was about 38 degrees. I wore several layers most nights as the temp was low 40s high 30s, and I wasn't freezing. The thing I love most is how small and light it packs. Carrying everything around for 6 days, it's the weight and room it takes in my pack that matters, and this bag is excellent in both regards. I guess it could be warmer near the temp rating, but having researched bag after bag, the tradeoff between price, packability, weight, and warmth keeps leading me back to this bag. I have considered buying a 0 degree or a 15 degree version, but I am looking for excellent value, and again keep coming back to this bag. I am currently planning another 5-night trip to the Grand Canyon, this time late November, and with my son. I am researching bags for him and started at the 0 degree. I want him to be warm. But the price points, and weight keep bringing me back here. It's a great bag. 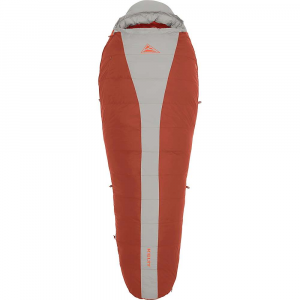 The only downside is if you are going to be camping below 35 degrees, you may need a silk liner, which would solve everything, or a lower temp rated version. But if you are carrying your bag, moving every day, for more than 2 nights, this bag is the real deal. Looks great after 4 years also. Thanks for the review, Franturk. That "Comfort Rating" is the temperature to look for. I've always wondered how a bag can call itself "32 degree" when its CR is only 46F? Goose - Thank You. I am currently really stuck in my research. Due to being married, I am looking for a bag under $200 for my son. I was warm using this bag in the Canyon, but when the temp hit the 30's, I was definitely bundled in and bundled up. It occurred to me the bag could be warmer for it's rating, but I still love the bag, especially the weight, size, and price given it's relative performance. I need a bag for late Nov. in the Canyon and temp range possibilities make me want to err on the side of caution, especially since my son is 11. ...continued - any ideas on a reasonably priced bag that weighs under 3lbs that would do the job? I'll send you a private message with some ideas. Neat eye candy, but plan on taking an electric blanked along with you on any but the warmest summer night. I cursed this bag as I froze every night of a summer backpacking trip. The Mountain Hardwear UltraLamina 32° is not available from the stores we monitor. It was last seen May 4, 2017	at Mountain Hardwear.